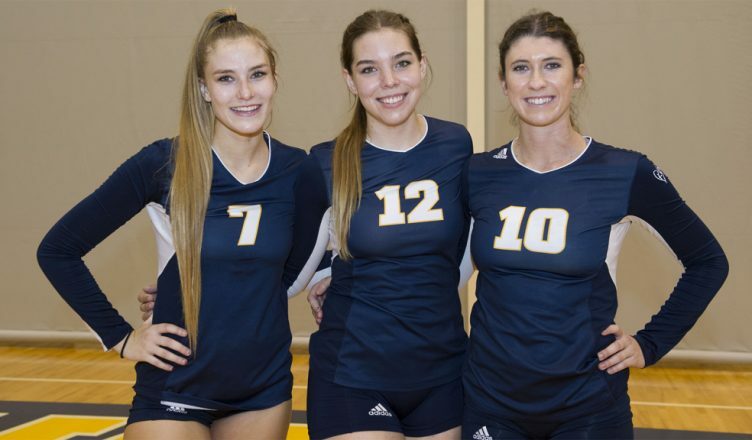 The UC San Diego women’s volleyball team posted a 3–1 victory over Cal State Monterey Bay on Friday night. While the win doesn’t alter their rankings, it places the Tritons (16–5, 10–3 California Collegiate Athletics Association) comfortably at second in their division. The first set of the night started off tight: The point differential stayed within two points well past the halfway mark. Unfortunately for the Tritons, the Otters managed to find their groove, scoring seven points straight, led by Otter outside hitter Kyra Galloway, taking control of the game. Though UCSD attempted a resilient set point stand, it was unable to rebound, losing the first set 21–25. In the final home game of the season, UCSD was unable to hold off a surging Cal State East Bay team. The Pioneers (14–9, 7–7 CCAA) upset the Tritons (16–6, 10–4 CCAA) in five sets. Assistant coach Jaye Loyd said it came down to momentum. Momentum was not in UCSD’s favor in the first set. Though the start of the set remained close, the Pioneers broke out, scoring six unanswered points. The Triton’s attempted comeback was plagued by self-inflicted errors and the Triton’s were soundly defeated 15–25. The Tritons quickly rebounded after losing the first set, like the night before. UCSD jumped out to a commanding 6–1 lead early in the set and never relinquished their lead. In this set, UCSD flipped the script, defeating Cal State East Bay 25–16. In the third set, the Tritons carried the momentum from their second set victory. A kill by Hammond set UCSD on a scoring streak that would continue until the end of the set. With a strong offensive performance, as well as multiple miscommunications and errors by their opponents, the Tritons easily handled the Pioneers, winning 25–13. Just as quickly as it swung in UCSD’s favor, momentum seemed to shift in favor of Cal State East Bay. After getting their first lead of the set, the Pioneers took command of the game, scoring 15 points to the Triton’s four to win the set. The final set started off close: Both teams understood that the game was on the line. No team was able to break the stalemate until the final three points. A service error by UCSD, followed by two other errors, gave the game to the Pioneers. In disappointing fashion, the Tritons fell 12–15 in the final set. UCSD will finish their season on the road, heading to San Marcos on Nov. 4 to play division rival Cal State San Marcos.